If you’re an adult data enthusiast, then you know what it feels like to uncover a powerful insight within your data. But this aha moment doesn’t have to be restricted to grownups. So how do you introduce kids with no data background into the data world? Give them that same aha experience, of course. Kid or grownup, it takes the same two ingredients to get someone started on their data journey: a data set that appeals to the person’s interests, and questions that the data can help answer. When you have these two things, you can’t help but be intrigued! And kids are no exception. Here are two activities that parents and teachers can use to get kids excited about data. 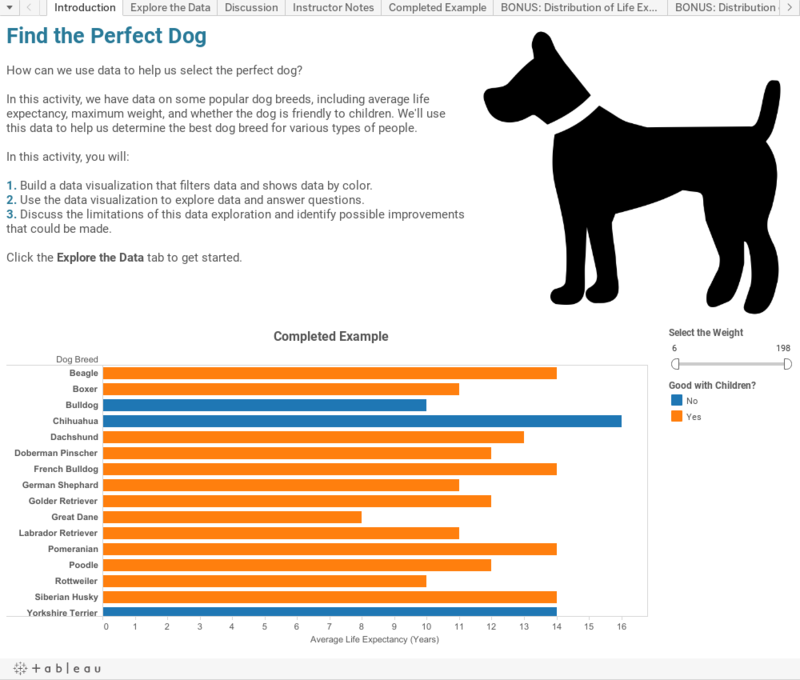 To get started, download the Tableau workbook, review the activity, and try it out. Be sure to read through the Instructor Notes tab for tips on how to guide the activity and enhance the experience. Here’s a great Halloween exercise. We chose M&M’s, but you can use any candy with a variety of colors in each package. This activity works best with multiple kids who each have a bag of candy. But it can also work well with one child who has many bags of the same kind of multi-color candy—after trick-or-treating, for example, provided you can prevent them from eating them all at once. In this activity, kids open bags of candy and collect data on how many pieces of each color are in each bag. A parent or instructor then helps them enter the data into a spreadsheet and visualize it in Tableau for analysis. Use the discussion questions within the workbook to guide the analysis. The idea is to take the kids through the data collection experience and help them explore color variance across the bags of candy. •	Describe the data collection process. 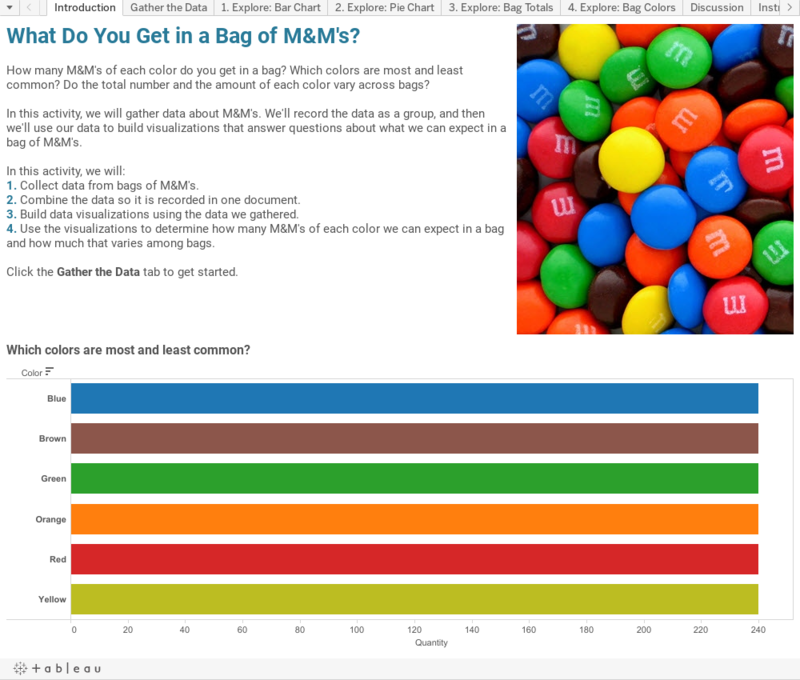 •	Interpret bar charts in order to describe the variance of color across populations (bags of candy). •	Make informed predictions about the commonality of each color. This activity teaches kids how to view and interact with data to answer questions or solve problems. You can also try this with younger kids if they’re already enthusiastic about data and/or have a patient parent or teacher to guide them. 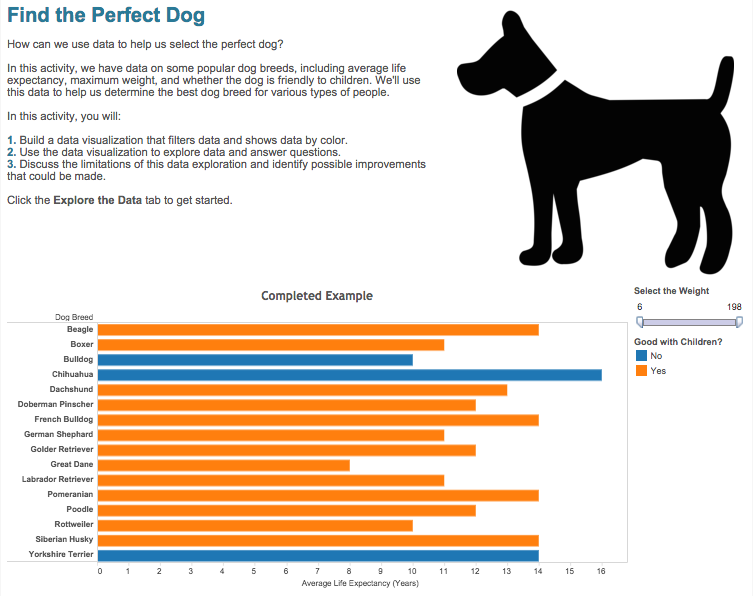 In this activity, kids use a data set of popular dog breed characteristics to help determine the best type of dog for some hypothetical future dog owners. They’ll consider various factors like the dog’s lifespan, maximum weight, and whether the breed is known to be good with children. A parent or instructor can use the steps and discussion questions within the workbook to build the view and guide the problem-solving activity. The goal of is to teach kids how to use data visualizations to answer questions and solve problems. •	Describe the concept and purpose of encoding data in color and in bars. •	Describe the concept and purpose of filtering data. •	Use basic data visualizations to answer questions and solve problems. Want to tell your kids about other kids using data? Meet young Ben Radburn, who visualized the most thrilling roller coasters around the world. If you're looking for more kid-friendly data, check out the data sets and activities from Tuvalabs, and lesson plans from Statistics Education Web (STEW). If you’ve got a Pokemon fan at home, try using this dashboard by Jewel Loree to ask and answer questions. We know many of you are teaching your kids about data, and we’d love to hear from you. Share your tips, tricks, and lessons learned in the comments below. Students of all ages can download Tableau for free through the Tableau for Students program. If you have questions about the program, email us at tft@tableau.com. I love this! I taught 150 4th graders about analytics and visualizations last year. What an amazing experience. Glad to see that others are training the Data Rockstars of tomorrow. Just back from the Vegas Tableau conference and my co-worker and I started planning a demo to a local 4th grade class - what perfect timing! Thank you for this! This information is really awesome.It is to handle the new technic and is useful for our future.It is used not only me but also all people.It is good information.thanks for this valuable blog.